The gross factor: The meat industry likes to call it "lean finely textured beef," but after news stories on it, the public just called it what it looks like--pink slime, a mixture of waste meat and fatty parts from higher-quality cuts of beef that have had the fat mechanically removed. Afterwards, it's treated with ammonia gas to kill Salmonella and E. coli bacteria. Then it gets added to ground beef as a filler. Food microbiologists and meat producers insist that it's safe, but given the public's reaction to news reports, there's an "ick" factor we just can't overcome. 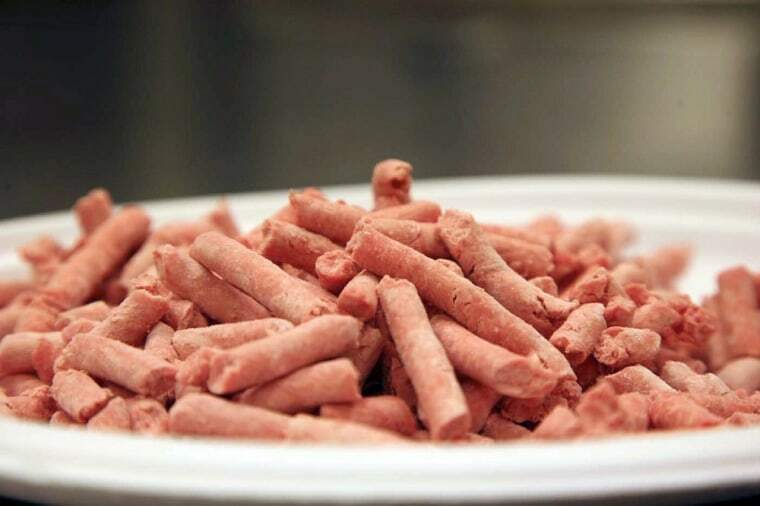 The primary producer of pink slime just announced that it's closing three of the plants where pink slime is produced, and Kroger, Safeway, Food Lion, McDonald's and the National School Lunch Program (among others) have all pulled it from their product offerings. Eat this instead: Organic ground beef is prohibited from containing pink slime, per National Organic Program standards, so it's your safest bet. If you can't find organic, ask the butcher at your grocery store whether their products contain the gunk. The gross factor: Hankering for a burger? Besides a hefty dose of protein, a 2010 report from the United States Department of Agriculture found your beef could also harbor veterinary drugs like antibiotics, Ivermectin, an animal wormer linked to neurological damage in humans, and Flunixin, an anti-inflammatory that can cause kidney damage, stomach and colon ulcers, and blood in the stool of humans. Still hungry? We didn't think so. Eat this instead: Look for beef from a local grass-fed beef operation that rotates the animals on fresh grass paddocks regularly, and inquire about medicine use. Typically, cows raised this way are much healthier and require fewer drugs. The meat is also more nutritious, too. If you're in the supermarket, opt for organic meats to avoid veterinary drugs in meat. The gross factor: Sugary and calorie-laden, those convenient instant-oatmeal packets all have one thing in common. They're sweetened with high fructose corn syrup (HFCS), which, according to tests from the Institute for Agriculture and Trade Policy, may be contaminated with mercury. The group tested 55 samples of HFCS and found mercury in a third of them at levels three times higher than what the average woman should consume in a day. The gross factor: Food safety experts refer to imported shrimp as the dirtiest of the Seafood's Dirty Dozen list, and it's not hard to see why when you consider the common contaminants: Antibiotics, cleaning chemicals used in farmed shrimp pens, residues of toxic pesticides banned in the U.S., and pieces of insects. Less than 2 percent of all imported seafood is inspected--clearly, that's a problem. Eat this instead: Look for domestic shrimp. Unfortunately, 70 percent of domestic shrimp comes from the Gulf of Mexico, and the recent oil spill may have long-term impacts on its shrimp stocks. But shrimp can be purchased from Texas, the East Coast, Maine, and the Carolinas, so you still have options. The gross factor: Hard-to-treat, antibiotic-resistant infections are no joke. Superbug strains like MRSA are on the rise, infecting 185,000 people -and killing 17,000-people annually in the U.S. Thought to proliferate on factory farms where antibiotics are overused to boost animal growth, a Jan. 2012 study from Iowa State University found that the dangerous organisms wind up in supermarket meat, too. The dangerous MRSA strain lingered in 7 percent of supermarket pork samples tested. The bacteria die during proper cooking, but improper handling could leave you infected. The spike in superbug infections is largely blamed on antibiotic abuse in factory farms that supply most supermarkets. Eat this instead: The Iowa state researchers found MRSA in conventional meat and store-bought "antibiotic-free" meat likely contaminated at the processing plant. Search LocalHarvest.org to source meat from small-scale producers who don't use antibiotics or huge processing plants. The gross factor: Bisphenol A (BPA), a chemical that acts like the hormone estrogen in your body, is used to create the epoxy linings of canned food. What food processors don't tell you is that the chemical was created over 70 years ago as a drug that was intended to promote healthy pregnancies. Though it was never used as a drug, the food industry saw no problem adding this pregnancy drug to a wide range of products, including canned food linings and plastic food containers. "Low levels of BPA exposure has been linked to a wide range of adverse health effects, including abnormal development of reproductive organs, behavior problems in children, cardiovascular disease, and metabolic changes that result in altered insulin levels, which leads to diabetes," says Sarah Janssen, senior scientist at the Natural Resources Defense Council. And its use in canned food is the number one reason why 90 percent of Americans have it in their bodies. Eat this instead: Look for products in glass bottles or aseptic cartons. Canned food manufacturers are in the process of switching over to BPA-free cans, but because those cans are produced in facilities that also produce BPA-based can linings, there's no way to keep BPA-free cans from becoming contaminated. Related: Will the FDA Finally Ban BPA? The gross factor: Turkey marinated in MRSA? It's true. A 2011 study published in the journal Clinical Infectious Diseases found that half of the U.S. supermarket meat sampled contain staph bacteria, including potentially lethal MRSA. Turkey was the worst offender: Nearly 80 percent of turkey products samples contain staph bacteria. Pork (42 percent) was next in line in terms of bacterial contamination, followed by chicken (41 percent), and beef (37 percent). Researchers ID the overuse of antibiotics as the culprit. The gross factor: If pregnancy hormones in your canned fruit isn't enough to make you turn to fresh, consider this: The FDA legally allows up to 60 percent of canned or frozen blackberries and raspberries to contain mold. Canned fruit and vegetable juices are allowed to contain up to 15 percent mold. Eat this instead: Perchlorate is hard to avoid, but some of the highest levels in the country have been found in California's agricultural regions. If you eat locally and in season, you can ask your local farmers whether it's a problem in their irrigation water supply. Related: Get Your Daily Fix of all things related to health and the environment!